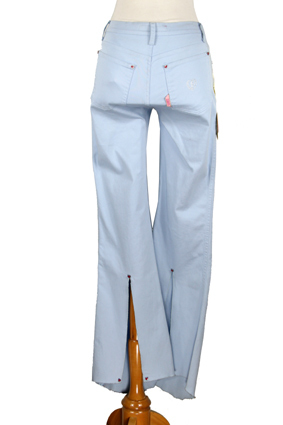 Voyage Passion flared jeans from early nineties collection, unused with tags. Zip and stud button fastening with belt loops. 2 rounded pockets with ticket pocket in right. 2 patch pockets at rear. Studs at pockets corners are metal hearts with read enamel centres. 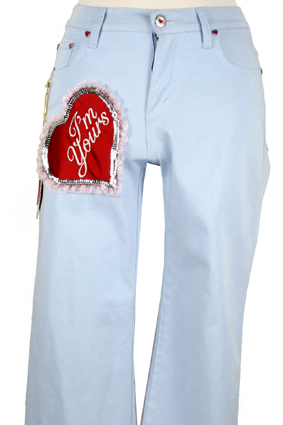 Applique heart on right thigh with frill and sequin trims and embroidered 'I'm Yours' on red. 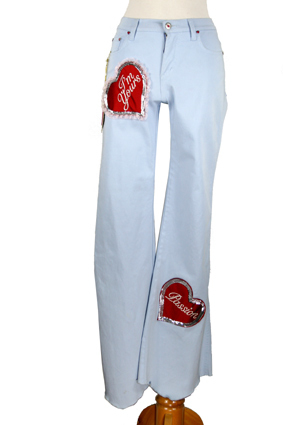 Another applique heart on lower left leg with sequin trim and embroidered 'Passion' silver on red background. Curved hems with vents at the rear with heart studs at each corner. 'VP' in in small glass crystals on rear right pocket. Excellent! 28inch waist UK 10.